3. To hold Hudson Valley Hour Exchange harmless from any and all liability, actions, claims and damages of any kind, including those caused by and/or arising from negligence for injury to person or property. 12. To maintain at least one OFFER and one REQUEST in the Hour Exchange or to list myself as “currently unavailable”. 13. To attempt to resolve any conflict amicably with another member. To refer any unresolved complaints conflicts or concerns to an HVHE coordinator who will help to refer you to appropriate community resource. Please provide phone numbers for two personal references. We CHECK all references to keep you and our membership safe. NO family or household members as references please! Click the 'Print References' button to see what kind of questions we will ask your references. Our new applicant has requested that you provide a reference in support of his/her application to become a member of the Hudson Valley Hour Exchange. 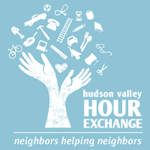 HVHE is a not-for-profit organization that builds community in the Hudson Valley by facilitating a community hour exchange. Members earn and spend hours, with every hour valued as equal regardless of the service. Because there is so much trust involved in exchanging among neighbors, we do reference checks on all potential members. 4. To your knowledge, does the applicant use good judgment? 5. How responsible is the applicant? 6. Does the applicant relate well to people of all ages? 7. Do you have any reservations about recommending this person to become a member of the Hudson Valley Hour Exchange? 8. Is there anything that you would like to add about the applicant to help us better understand his/her character, skills, gifts, talents? 9. What are the best times to call you? Preferred phone number(s)? Thank you for your time! We invite you to find out more about our organization and explore the benefits of joining. Find out more at http://www.HudsonValleyHourExchange.org! We respect and value every single person's time and skills.